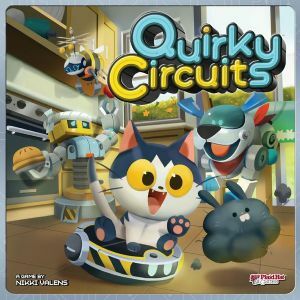 Quirky Circuits is a game of robot programming silliness in which each player contributes to the programming of an adorable robo-friend. But be warned — no one knows which commands the other players will be tossing in! Will you be able to help the little robot complete its task, or will you unleash automated mayhem? Be careful for you'll have to work together before your robot's battery is drained! With 21 scenarios of increasing intensity, Quirky Circuitsis guaranteed to provide hours of brain-bending fun.